Performance at Strut Your Mutt-NMHP. 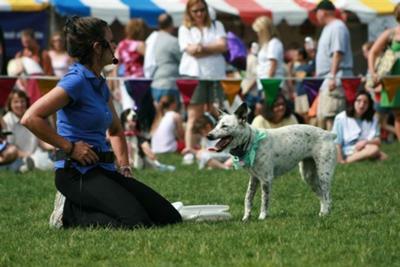 Dazzle Dogzz will "WOW" audiences with their high flying Frisbee catching, dog dancing dogs! Adding in the mix; sports activities played with the dogs along with audience participation. Dazzle Dogzz is a fun unique alternative for entertainment. The show is approx 30 minutes long, we have indoor and outdoor possibilities and our own sound. Our set-up takes between 30-45 minutes and tear down about the same. Setting up mats for indoor takes at least 45 minutes. Dazzle Dogzz is fully insured. We would travel most anywhere as long as travel time and mileage were included.